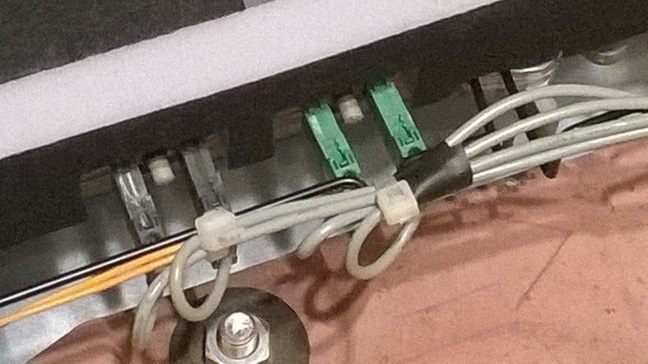 My Bosch WVG30461GB has twice in the last month stopped drying clothes, both times I've removed the top cover from the machine and pressed the small switch between the two green connectors in the photo which has reset the machine and solved the problem. I know how to fix it but don't know why the switch (presumably some sort of overheat safety device?) is tripping in the first place, can anyone help? Hello Iain. You are right to be concerned. If it trips out once and then carries on OK after resetting that's one thing, but if it trips out more than once there is clearly something causing overheating. I have an article here about a washer dryer (or tumble dryer) not heating which includes a section on tripping TOCs. See if it helps. On a washer dryer it can be caused by overloading, or the water not trickling into the condenser, or being blocked from running into the drum, or a faulty dryer fan - or even a blockage in the condenser or heating element compartments. The problem continued so suspecting a faulty sensor I decided to order a replacement Temperature Limiter from Partsmaster for £33.29. I fitted this but after a couple of days the same problem reoccurred. It happened again today, so while I had the lid off for the umpteenth time to reset the limiter I decided to bite the bullet and dismantle all of the hot air extraction ducting and extraction fan housing. 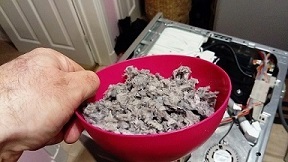 There were a few bits of fluff in the ducting itself but the extraction fan was another story, the gaps between all of the fan blades were clogged solid with fluff/lint, it is no wonder the sensor was tripping due to overheating as the fan will have been barely drawing any air in this state. After about an hours work with a pair of tweezers I had cleaned the fan out and had collected the dish full of fluff in the photo. I expect the drying performance of the machine to improve dramatically after this clean out, and presumably the temperature limiter trip problem should now be sorted. No I didn't see the link from the forum, though I did come across your site (and maybe one other very similar?) while googling for parts suppliers and noticed that apart from the top banner the sites appeared to be the same. I can't say I'm impressed with the Bosch design - the appliance is only around 18 months old but I had noticed a deterioration in drying performance from when we first bought it. Surely Bosch can't expect customers to inspect/dismantle their machine once a year in the way that 've just had to do to keep it in decent running order? I can manage it as I consider myself reasonably handy with a set of screwdrivers, but there will no doubt be many others with the same issue who will end up paying extortionate fees for a Bosch engineers visit to do the same job. I'm a bit cheesed off that I spent £40 needlessly on a replacement sensor (obviously this could have been avoided if I'd made the effort to trace the cause of the impeded air flow earlier), but also that we'll have been using a lot more electricity to essentially 'steam' rather than dry our clothes for the past six months or more. Thanks. I have just a small list of affiliate inks after the first post on every topic and 2 links in my sig. I was hoping they'd still stand out instead of banner ads. Just double check the instruction book btw way to ensure there is nothing you need to do to help keep the parts clear. With a normal dryer there are several filters to clean out but with washer dryers there isn't anything you can normally do. I think I've heard of a special maintenance cycle but I might have imagined it. If there's nothing you can do and it clogs up regularly I would say that's a design fault. Ok so I have an identical machine, and after many months of poor drying tried this and exactly the same , the fan impeller was totally clogged !! Are all washer driers prone to this , or is it a particular issue with this machine? if this is an issue then a user cleanable filter should be installed , I'm gong to need to be doing this every year or use a separate dryer . Does anyone know of an easy solution as I had to remove all the top ducting and control panel to access the fan. I wpold say beyond the skill set of most users . No other option I'm afraid but to strip it down and clean it yourself, I'm having to do it about every six months but the frequency will obviously depend on how often you use the machine for drying. Bosch engineers must be kept going by customers who have the same problem but are none the wiser. If this is something that is happening regularly then it could be argued that it is a design flaw. The way that a washer dryer works makes it impossible to have a filter in the drum like there is on a tumble dryer. Unfortunately fitting a filter elsewhere is probably tricky. Manufacturers are not going to fit a filter which needs cleaning by customers that is only accessible by taking off the lid and messing around with the insides. It is possible that this only happens if the dryer is overloaded. I'm not saying that is definitely the case. But I would strongly recommend that you get hold of the instruction manuals for these machines and thoroughly read them with regard to using the dryer. A washer dryer typically can only tumble dry half of the load it is capable of washing. Therefore every time you wash a full load, when it has finished spinning you will have to take half of the load out. If this isn't being done, all it is being inadvertently overloaded on the dryer cycle, it will drastically interfere with the efficiency of the dryer. It would interfere with the airflow, and it will certainly cause the laundry to take much longer to dry. For me this could theoretically cause extra damp conditions inside which may allow the fluff that should end up being pumped out down the drain to stick to the sides of the fan chamber and fan blades. The fan blades might be getting wet through with condensation and excess moisture. That's exactly what we do, wash a load then split it and do two dries. I don't see what difference the amount of washing being dried would make anyway, the way the condenser drier works means that the hot air being drawn off from the drum is always going to be saturated with water vapour, particularly at the start of the drying cycle when the washing is at its wettest. 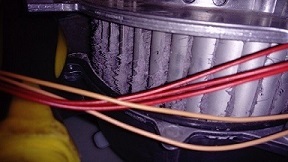 The problem is the free fibres that are released during the washing cycle and also the drying cycle aren't prevented from getting to the fan, but as you say there's no easy way of putting a filter anywhere in the current air draw off ducting between the drum and the fan that wouldn't still require removal of the lid for user access. Other than a complete redesign to put a filter on the front or back of the machine, I can't see what can be done other than to accept that it's a flawed compromise which doesn't work. Hello Iain. If the drum is overloaded during the drying cycle then air cannot flow properly through the whole system. You will get a big buildup of steam. Air is sucked in from the fan on top of the drum, and blown over the heating element. From there it should blow down into the drum and through the laundry. The hot air should then go through to the condenser chamber at the back of the drum when it hits a flow of cold water trickling inside. Should then condense into steam and get pumped out down the drain. In theory there is no need for fluff off the laundry to get onto the heating element. Don't forget this is not a complete cycle like it is on a tumble dryer. The air that is drawn in and blown over the laundry should pass through the laundry and out through into the condenser chamber. It shouldn't recirculate back to the heating element. Therefore I am guessing that this sort of problem would be much worse if the drum is overloaded. If you know you are using it correctly but this problem is a constant issue then I would say it is a design fault. Actually I’ve been thinking about this since posting. Maybe air is recirculated? Hi all, this thread seemed best for my call for help. I have a Bosch Serie 3 washer dryer (WVG30461GB/01), and am not getting heat from the dry cycle. I found the TOC's which had tripped, but they have continued to do so after being reset, so as per comments in this thread, there must be another problem beyond probably overloading (which might have been the source of the problem!). I would like to check/clear out any lint from the fan, but cannot work out where this is?! The Bosch user manual doesn't seem to even try to explain the inner workings! Any help would be much appreciated as to where I should start. The fan is the circular grey object visible at the rear right hand side of the machine once you take the lid off, the hot air ducting leads to it. You'll need a T20 torx bit I think to remove the screws which hold the top cover of the fan, you won't be able to get the fan cover off fully but that doesn't matter, you only need to lift it enough to provide access to the fan blades. I just use a set of tweezers to pull the lint out from between the blades. Great stuff Iain- many thanks for responding! I'll give that a go tomorrow! Hi Iain- I managed to get into the fan and all seemed to be clear of lint. Do you know where I can find the filter to try clearing that out please? There is no filter, that's the problem, the moist air is drawn straight off the drum by the fan. That's a bit concerning; if it isn't obstructed with lint/fluff then the fan should remove the hot air efficiently enough so that the overheat sensor doesn't trip. Just an update - I had the fan cover off yesterday and it was absolutely clogged with compacted lint. Pulled out as much, if not more than Iain's pictures above!! Quite alarming at how compacted it was between the blades. Also took the duct cover off as much as I could and it didn't look quite as bad but annoyingly the sensors triggered yesterday during a test run. This morning I had it apart yet again and cleaned up the duct (where the sensors are specifically) and also ran the "Fluff Clean" cycle on cold, which admittedly I had probably not ran anywhere near as often enough previously (knowing what I now know) AND ran an empty wash cycle with some washing machine cleaner in. It's currently drying 1/4 of what was on the wash cycle (decent sun today so most stuff went on the line). Fingers crossed, otherwise I'm kind of out of ideas. Unless triggering and resetting the sensors so much has made them prone to trigger more easily? Is that a thing? Perhaps running the Fluff Clean cycle more often is key to solving this? It doesn't stress in the manual that it's even necessary, only to run it when drying cycles aren't working as they should. Recently moved to a bigger house, very first thing we bought was a cheap conventional Indesit tumble dryer . The last few months before we moved saw the Bosch permanently in the middle of the kitchen floor with the lid off. Totally given up on the Bosch , now used for washing clothes only.